Hey strangers! I know, I know...it's been a long time yet again. This whole moving to one state and back again thing has a way of killing one's ability to be very productive every day, especially when it comes to crafting! We're getting fairly well settled into our new home, but are continuing to work through boxes that have been packed for months. We had the downstairs painted last week and I'm finally able to start hanging things on the walls. However, we are planning a kitchen redesign so I still have lots of stuff that needs to remain packed until that process is complete. Not that I know when I'm going to find time for that kitchen update...LOL! Well, until that happens...let's check out some recent artwork I created for The Crafters Workshop. This project was posted on their blog Saturday, but I thought I'd share the process photos on my blog today. Let's go! The jumping off point for this spread was an Inspiration Wednesday video. During this video, Donna used watercolors, which was where I started. I was thrilled with the soft, summery colors that were produced using the watercolors, and the rest of the spread transpired from that point. I started by adding some masking tape to both pages of my journal, and covered everything with gesso. I used Peerless watercolors for my painting. If you don't owe these watercolors, get them! They are papers infused with pigment, the activate when you touch them with a wet brush. I used a very wet brush and variety of colors to create the background. The gesso keeps the watercolor from soaking into the paper, which keeps the colors light and bright. I loved the look of the background so much I didn't want to add anything else to the page! Since I liked these pale colors so much I didn’t want to add anything with a drastic contrast so I used sections of the 12×12 Screen Print stencil (TCW525) and Tea Dye Distress Ink to add some subtle shading. Next, I used a gold paint pen to trace around a few of the images. This added just the tiniest bit of shine and highlighted the designs. I also used Wendy Vecchi’s embossing paste, in white, to add the dragonfly image (also from the Screen Print stencil). Once the embossing paste was dry, I put the stencil back over the embossed area (basically using the stencil as a mask now), and painted the dragonfly with various shades of Distress Paint. I added two dragonflies to this spread, one on each page. I added more stenciling in the background, using the Believe Script stencil (TCW541) and Wendy Vecchi’s Watering Can Archival Ink. I also added some stamping, from some random Tim Holtz stamps, and gold paint flecks. Lastly, I added some shading to the dragonfly using some Faber Castell Big Brush Markers. I added a quote using alphabet stamps from Tim Holtz and black Archival Ink. See the rest of my photos below! 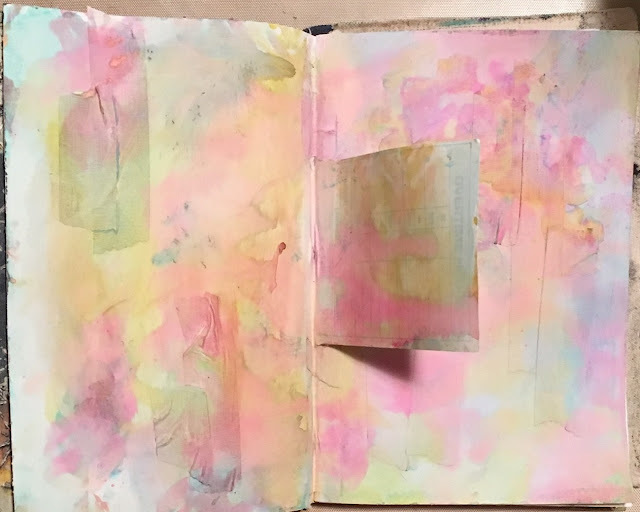 I hope you enjoyed today's art journal project! Happy crafting! Hi friends, welcome to the weekend! I have a project posted on The Crafters Workshop blog this morning, featuring masks, ink sprays, and these two cuties. **smile** Hop on over to check out all of the details! Hi folks! I'm back again with another Inspiration Wednesday project! Are you starting to feel like these are the only projects I'm sharing? Well...if you're feeling that way, you would be right! The truth is that I've had very little time to create and even less time to post. 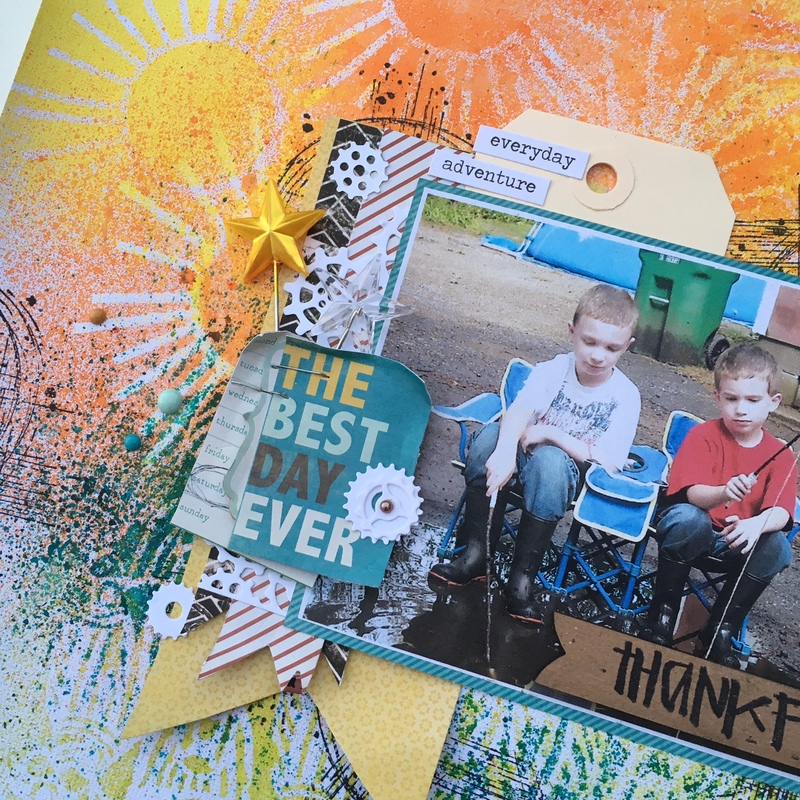 The IW projects are typically quick to finish, and since we're following most of the steps from Donna Downey's video, it's an easy layout to finish...not much thinking required on my part! LOL! The good news is that I'm making good progress on unpacking my craft supplies, as well as finding all sorts of creative ways to store all of them, so I hope to be back to posting more regularly in a few weeks. The left side of my spread features this amazing polka dot paper and tiny yellow butterflies (from a Martha Stewart punch). Note that both wrapping papers were sanded with a Tim Holtz sanding block...that worn look is divine! I added some rhinestone trails to each butterfly and came across this cute "handle with care" piece in my stash. I don't recall who made the embellishment, but it's wooden and I purchased a bunch of these at my local craft store. The left side of my spread featured this beautiful cream and black paper, which was a great contrast to the red polka dots. Again, the paper was sanded and I used a glaze and acrylic paint to add some aging to the page. My collage is made up of a piece of burlap, a Tim Holtz red lined tag, a stenciled face (from a Crafters Workshop stencil, see links below), some twine, a manila tag, and another tiny butterfly. I'm finding that I love these collage clusters...the only challenge is finding enough elements to fill in the space. I love the half a face peeking out from behind the tag. The inclusion was whitewashed with gesso before I added the letter stickers. The lines around the "beautiful" word was hand drawn, and the butterflies are from more Martha Stewart punches. Here's the entire finished piece...don't those contrasting patterns and colors look fabulous together! Love it! (Donna's video was based on mixing patterns...very fun!) Links to products below, and stay tuned for something other than IW2016 projects! I hope...LOL! Happy Crafting!